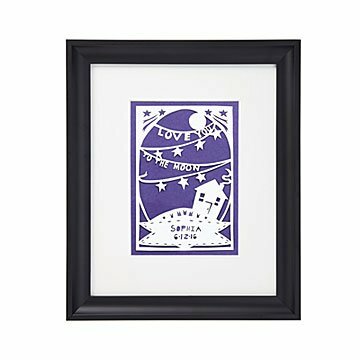 This charming papercut by Annie Howe is a lunar lullaby personalized with your child's name and birth date. How much do you love your little one? How about 238,900 miles worth? This charming papercut by Annie Howe is a lunar lullaby personalized with your child's name and birth date hand cut into the design. Available in four different color combinations and beautifully framed, it's an instant keepsake and sweetly serene addition to a bedroom or nursery. Laser-cut design with hand-cut personalization. Handmade in Baltimore. Visit the blog learn more about Annie Howe and her personalized papercut creations. After graduating from the Maryland Institute College of Art with a BFA in Fiber, Baltimore artist Annie Howe worked in the Baltimore art community for many years, creating large-scale puppetry and shadow puppets. As her love for storytelling grew through this large medium, she found her focus as an artist shifting from large 3D objects to the smaller, more intimate medium of paper. She founded her papercut company in 2010, creating handmade papercuts for businesses, publications, and private collections. All art on paper should be protected from moisture and from prolonged, direct sunlight.